With the ball at his foot, he’s untouchable. One-part Superman, one-part Picasso, one-part Houdini combines to make David Velastegui, captain of Sheridan men’s soccer team. At 5-foot-10, Velastegui has a moderate build, but his legs are as thick as tree trunks. His power on the field is explosive, his quickness elusive, all within a solid frame that threatens the potential for an offensive onslaught. 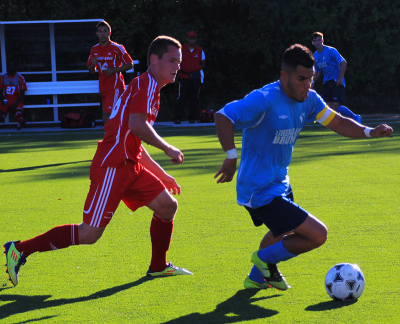 A fourth-year student in Business and Marketing, Velastegui has been the guiding light for the Bruins since 2010 when he scored Sheridan’s lone goal in an OCAA Championship loss to Humber. 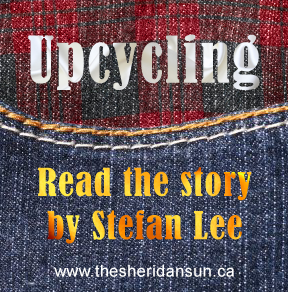 The next year he was named team captain, and led Sheridan to its second OCAA silver medal in as many years: a pipedream from two years earlier when Sheridan’s men’s soccer team floundered to a disappointing 12th-place finish. To complement his assortment of hardware, the 23-year-old midfielder also led the OCAA in scoring this year – netting an impressive nine goals in eight games – and was recently named a CCAA All-Canadian and an OCAA All-Star to cap a remarkable season. “This year I was able to remain healthy, and it worked out well for myself and the team, so I’m really happy about that,” said the fourth-year captain, who is playing in his final year at Sheridan. Little did he know that step would cover a distance of 7,700 kilometres. In 2013, Velastegui was contacted by an agent who provided him an opportunity to play in Paraguay’s second-division professional soccer league for Sport Colombia, which was based out of Fernando de la Mora. “The experience was amazing,” said Velastegui, who left the team due to the club’s limited financial resources, which made it difficult for him to support himself in South America. Upon returning to Canada, he was ready to return to the Sheridan soccer team, and fulfill his duties as captain. He’s soft-spoken, but engaging, present and thoughtful. When something needs to be said, he’ll say it, and if something needs to be done, he’ll do it. First-year General Arts and Science student Shane Douglas, who is in his fourth year at Sheridan, has played with Velastegui for four years now and believes a true leader in sport is someone who can lift a team up when their teammates are down, and keep composed when the team is winning, traits he believes exist in his captain. So much so that he deemed Velastegui “vital” to the team’s success. And he’s not alone. Third-year midfielder Kwesi Williams also characterized Velastegui as “vital” to the team’s success, and offered perspective on a Velastegui-less team. This year, Velastegui has signed with Toronto Croatia of the CSL, which is a Canadian semi-professional soccer league. He says this provides him an opportunity to play with top payers in North America as well as players from soccer-dominated Europe, which has a level of training unparalleled in North America and will ultimately benefit the growth of his own skills. Currently, his focus remains the CCAA National Soccer Championship that will be held at Trafalgar this weekend, and accomplishing something that he hasn’t so far: winning a gold medal for Sheridan. Added by spencerluyben on November 4, 2014.